We are pleased to announce that we have added the complete line of Tex Shoemaker and Sons products. Tex Shoemaker is well known for their fine leather goods and equipment for Sportsman, Law Enforcement, Fire Fighters and EMS Personnel. In addition, Triple K Industries has also joined with us. Triple K also offers a complete line of leather goods and equipment that includes Western Belt and Holster combinations, Rifle Slings and Scabbards, Cartridge Holders and more as well as Law Enforcement Leather and equipment. 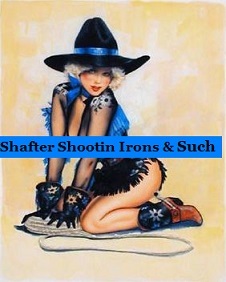 Whatever your need, Sportsman, Recreational Shooter, Hunter, Military Enthusiast, Law Enforcement, Etc.. Just starting out, or Old Pro, Shafter Shootin Irons & Such, will do our very best to provide you with the best quality merchandise possible, and one on one, personal, professional service.